TOYOPEARL NH2-750F is a salt tolerant anion exchange resin capable of aggregate removal in both flow-through and binding and elution modes. The resin is composed of polymethacrylate beads that have been functionalized with proprietary primary amine (NH2) strong anion exchange groups. TOYOPEARL NH2-750F is ideal for process scale applications ranging from the purifications of proteins from biological feedstock (mammalian cell culture, plasma, bacterial feedstock, etc.) 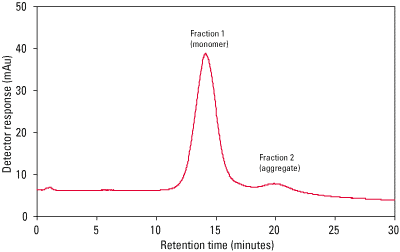 without dilution to the intermediate or final purification of monoclonal antibodies (mAbs) where aggregates and other impurities are removed from the target of interest. 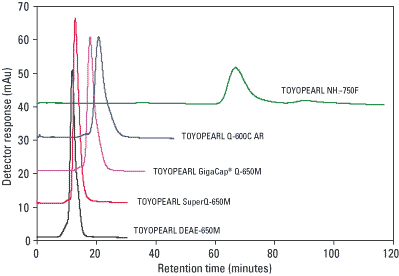 TOYOPEARL NH2-750F is available in 45 µm particle size (F-grade) and exhibits typical binding capacities of 70 g/L for BSA. It maintains its high capacity at increased linear velocities and has good pressure-flow characteristics.